Remarkable progress in understanding the dynamics of the planets has been possible thanks to their relatively small masses and the overwhelming dominance of the Sun. The figure below shows the relative masses of the Sun, planets and some natural satellites, taking the mass of Earth to be unity. This week, That’s Maths in The Irish Times ( TM041 ) is about an ambitious program to unify mathematics. Mathematics expands! Results once proven to be true remain forever true. They are not displaced by subsequent results, but absorbed in an ever-growing theoretical web. Thus, it is increasingly difficult for any individual mathematician to have a comprehensive understanding of even a single field of mathematics: the web of knowledge grows so fast that no-one can master it all. An ambitious programme to unify disparate areas of mathematics was set out some fifty years ago by Robert Langlands of the Institute for Advanced Study in Princeton. The “Langlands Program” (LP) is a set of deep conjectures that attempt to build bridges between certain algebraic and analytical objects. 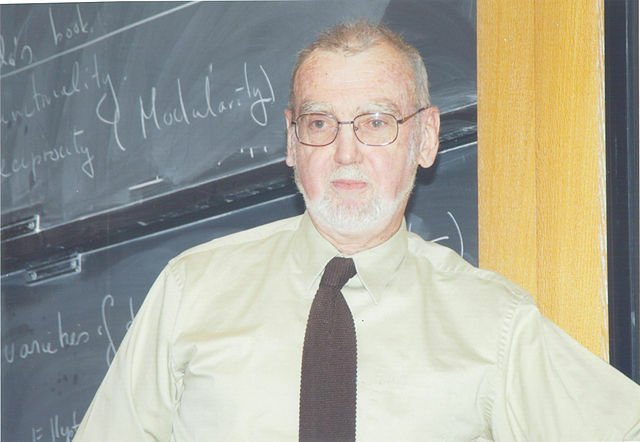 Canadian mathematician Robert Langlands, who formulated a series of far-reaching conjectures [image from Wikimedia Commons].